Rondel daggers were in widespread use from the 14th to the 16th centuries and came in a myriad of forms. 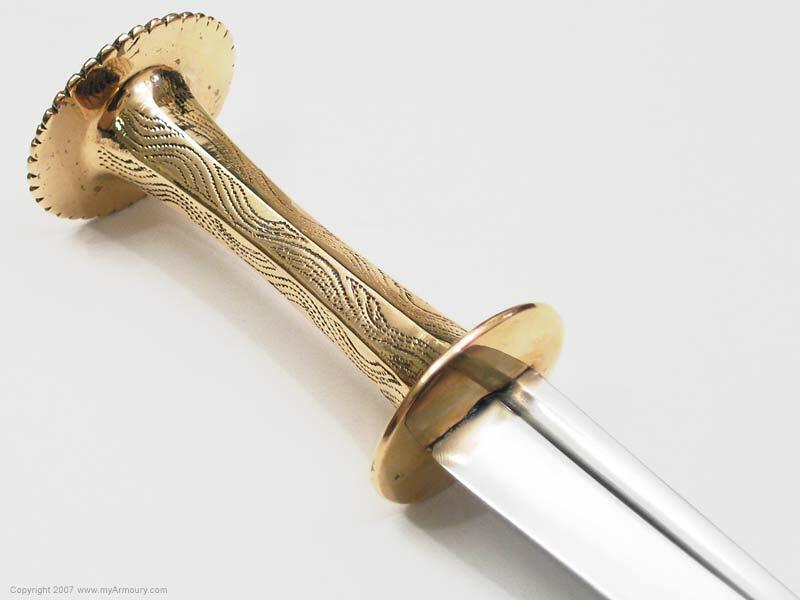 Named for the discs (rondels) used for guard and/or pommel, they were popular with the knightly class, as their shape naturally locked the dagger into the hand. 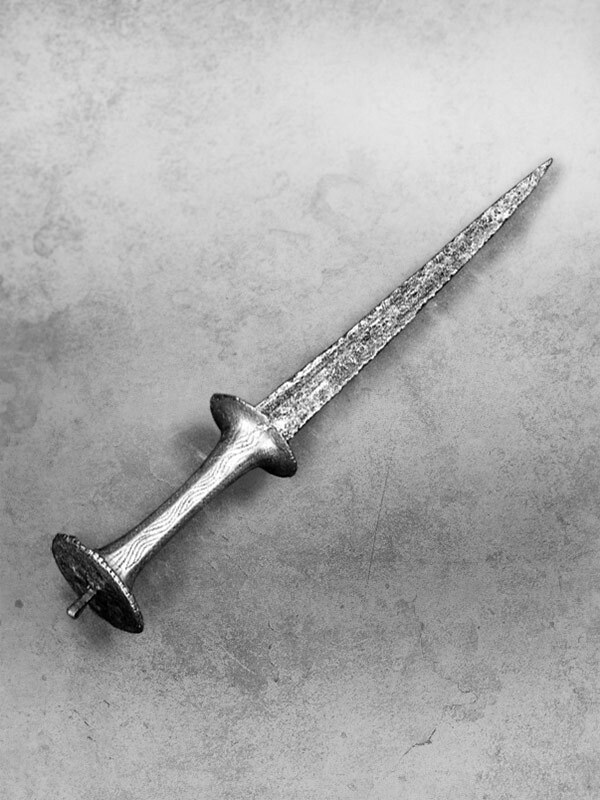 Not many examples from the 14th century have survived, but a beautiful example from the Museum für Deutsche Geschichte shows a slightly different construction from many other surviving rondel daggers. 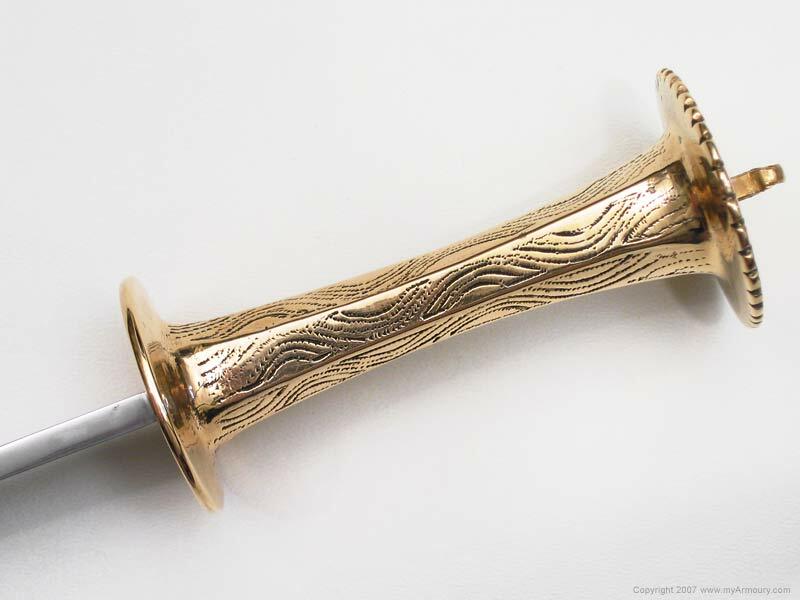 The museum dagger's grip is constructed of bronze plates, likely in several sections. 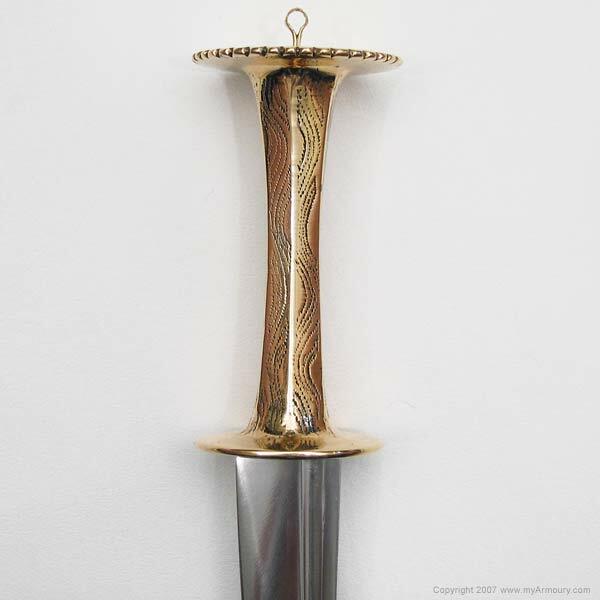 The faceted grip is decorated with many punched and engraved wavy lines. A curious feature is the loop attached to the pommel, perhaps for attaching to the cuirass via a chain, something popular during 14th century to keep swords, daggers, and some helmets from being lost in battle. 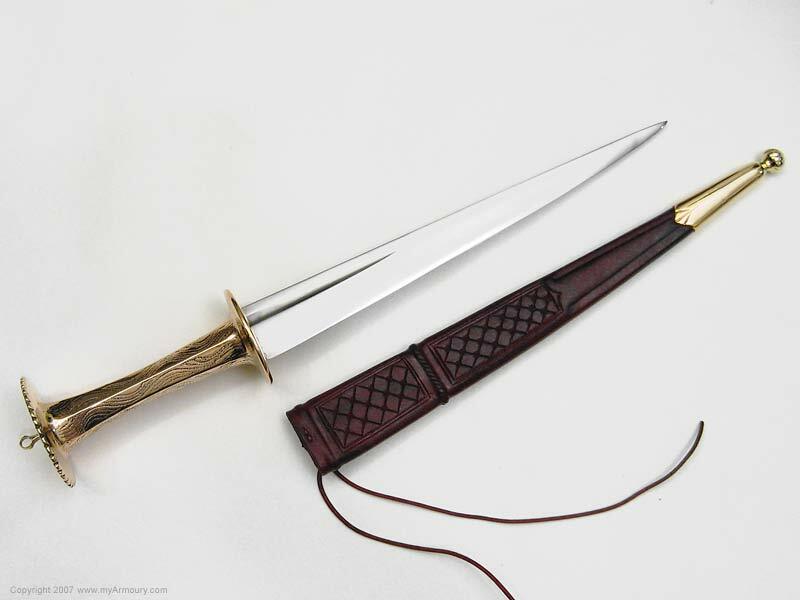 The dagger here is inspired by the German dagger, though with some differences. The grip is cast in solid bronze and the entire hilt is about 1/2 an inch longer than the original, to better fit my hand. To balance the solid grip, the blade has been made wider than the original and about 1/2 an inch longer. 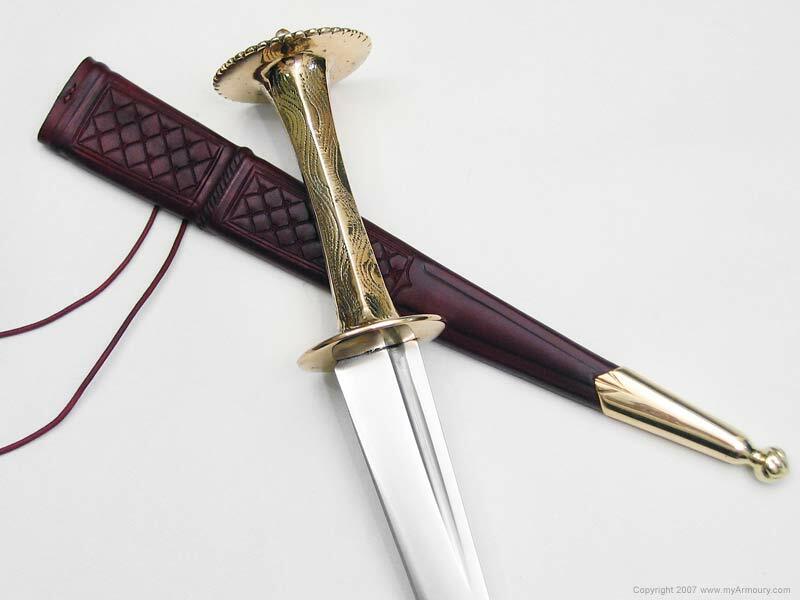 The scabbard is made of two layers of heavy leather, dyed a deep maroon and tooled on the front and back. The front of the scabbard is tooled in panels of diapered lozenges. A raised band in the middle has diagonal hash marks, while the back of the scabbard is tooled in simple lines following the blade's edge. 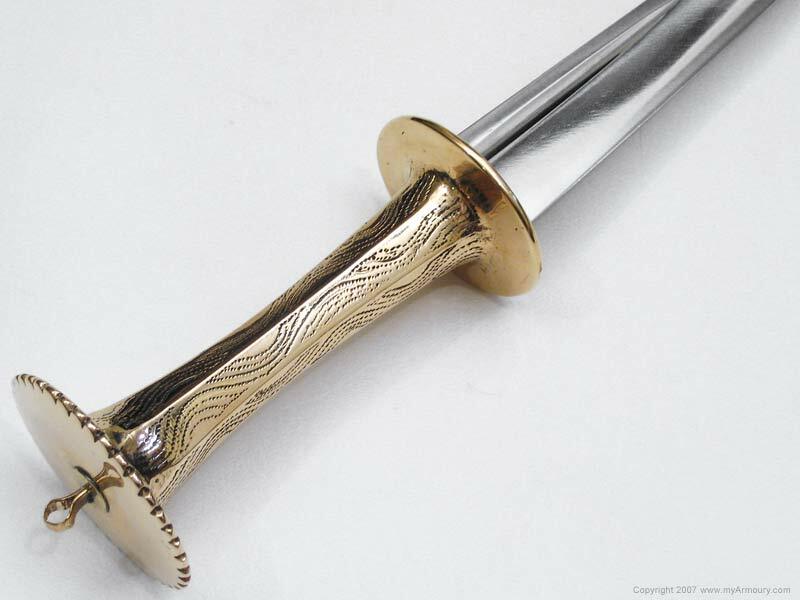 The scabbard's chape is of bronze with a knurled finial. Blade: 9.5" long; 1.25" wide tapering to .312"
Based on a 14th century piece at the Museum für Deutsche Geschichte.